As the second fastest growing metropolitan area in Texas, San Antonio is a top choice for those wanting to start a new career and a fresh new start at life in a fun, vibrant city. For equipment operators specifically, jobs are not hard to find all throughout the city since their job is always in demand. If you’ve been wanting to begin a new rewarding job, consider becoming a forklift operator with a San Antonio forklift certification. City employers also require forklift certification in San Antonio for a different reason; they’re responsible for providing all forklift training for their employees. If your company is involved in a forklift accident and OSHA determines your employees don’t have training, you’ll face steep fines and penalties.San Antonio forklift certification is a great idea for both employers and employees. We’ll help with all of your OSHA forklift compliance training needs – sign up and register today! Why Get a San Antonio Forklift Certification? If forklift operators are in demand, you may be wondering why it’s necessary at all to receive a forklift certification San Antonio. The answer is, to put it simply, employers won’t hire you without one. This is because forklift training and certification is a requirement set by OSHA to protect employees in the workplace. Fatal forklift accidents happen every year, and forklift certification training is the best way to prevent these accidents. Besides protecting your life on the job, San Antonio forklift certification is the best way to qualify for the best jobs. Employers simply aren’t willing to risk the safety of their workplace and being hit with costly OSHA fines. Another cool thing about forklift certification in San Antonio TX is the variety of jobs that are available for trained forklift operators. From nationally recognized companies to hospitals and even breweries, San Antonio doesn’t lack companies that need forklift drivers! But whether you’re a worker or employee, you need San Antonio forklift certification to meet OSHA jobsite requirements. Caterpillar Inc, with headquarters in San Antonio, Europe, Africa, the Middle East and Asia Pacific. Choose CertifyMe.net for San Antonio Forklift Certification and Get Your Employees Trained Today! OSHA requires that every San Antonio employer provide forklift training for employees. Handling this on your own can be expensive and frustrating. Plus, are you up to speed with the latest OSHA requirements? CertifyMe.net is – and we’ll help with your San Antonio forklift certification today! Choose our online program at CertifyMe.net and become qualified to operate forklifts in less than one day! You don’t need to find a training facility to earn your San Antonio forklift certification, and you don’t need to spend hours of your time or hundreds of dollars. We’ve made it easy, convenient, and affordable to receive your forklift training. On any device with an internet connection and at your own pace (although it typically only takes our students one hour to complete! ), you can finish your forklift training and be qualified to apply for the best jobs. Choose one of our top forklift programs for equipment-specific training, or bundle and save on all three! What are you waiting for? 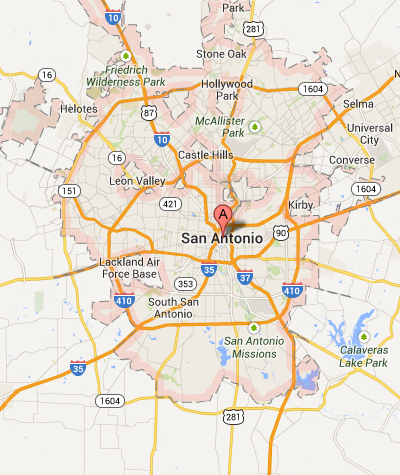 Start your exciting new career in San Antonio with forklift certification San Antonio! Let CertifyMe.net handle your forklift certification in San Antonio. Contact us today and get started with your safety program! Do you have other training requirements throughout the Lone Star State? Learn more about forklift certification in Texas.